In 1969, Sa’adia Marciano and Charlie Biton—along with four other Moroccan-Jewish youth living in the poor Moroccan-Jewish section of Jerusalem, Israel—started meeting to discuss North African Jews’ experiences of joblessness, police beatings, housing and education discrimination, and exclusion from government political offices and positions. When they read about anti-racist liberation movements in other countries, they decided in 1971 to name their group the Israeli Black Panther Party (IBPP). They used the Panthers’ well-recognized name to “make the government take this group seriously,” and to draw national attention to the fact that Israeli discrimination against them was similar to the experiences of African Americans. They adopted the Black Panthers as their model for protesting and organizing. Once Israel became an established state, Ashkenazi Jews became the state leaders, and excluded the Mizrahi from political power, even though the Mizrahi comprised 65% of the Israeli population. Israeli leaders saw Mizrahi as Arabs, “Black Jews” whose values and customs were antithetical to those of Israel. The Mizrahi were needed to provide menial low-wage labor, but they often made only 10% of Ashkenazi income. The millions of dollars donated by American Jews went to new Russian immigrants and Ashkenazi neighborhoods, and not to the poor Mizrahi neighborhoods. Consequently, only 45% of Mizrahi teenagers were in school in 1970. The IBPP presented the first serious threat to the status quo in the history of the state of Israel by exposing Israel’s class and ethnic discrimination. They held their first demonstration on March 3, 1971, in Jerusalem, to protest discrimination against Mizrahi. Because of their “Black Panther” name, there was front-page newspaper and radio coverage of the demonstration. In April, Prime Minister Golda Meier agreed to meet with the IBPP, but only after they started a hunger strike at the Wailing Wall. Because Meir knew that the U.S. Black Panthers repeatedly denounced Israeli oppression of Palestinian Arabs, she feared the IBPP would form an alliance with Palestinians. Consequently, she appointed a commission to study “Youth in Distress” and found $22.9 million to fund services for Mizrahi. The IBPP continued to challenged Israel’s official rhetoric that all Jews were treated as equal members. 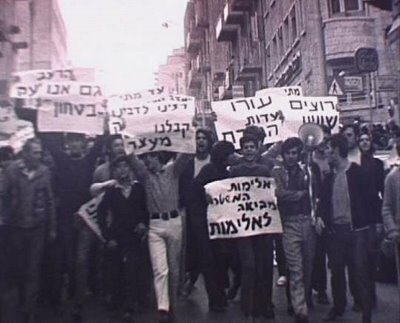 They held large demonstrations in Jerusalem, including the “Night of the Panther” on May 18, 1971, with 4,000 Mizrahi demonstrators. Using the Black Panther model of community self-empowerment, the IBPP also addressed basic needs like food and clothing by creative activities such as “liberating” milk bottles from milk trucks in middle-class neighborhoods to give to poor families. In 1973, the IBPP became a political party. Biton, an IBPP founder, was elected to the Israel Parliament in 1977, where he served until 1992. While the IBPP disbanded in 1977, their lasting legacy was the establishment of the Mizrahi as a political force with a right to speak out. Otman Aitlkaboud, “Jewish Arabs and the birth of Israel’s Black Panthers,” TheNewArab, (May, 2016), https://www.alaraby.co.uk/english/indepth/2016/5/15/jewish-arabs-and-israels-black-panthers; Anne-Marie Angelo, “‘Any Name That Has Power’: The Black Panthers of Israel, the United Kingdom, and the United States, 1948-1977,”Ph.D. Dissertation, Duke University, 2013; Deborah Bernstein, “Conflict and Protest in Israeli Society: The case of the Black Panthers of Israel,” Youth & Society 16: (December 1984).